I seen a layout on Stamping 411 and changed it just a bit. The original layout called for the sentiment to be in the lower left corner but I like it better where I put it on this card. I rather like it! What do you think?? And I didn't feel like making any more Christmas cards for now. LOL! 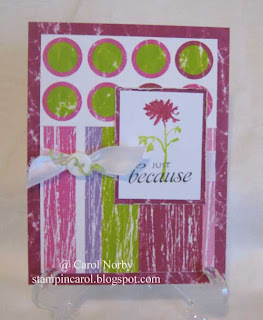 Love the bright colors and how the 'just because' is layered onto the watercolor plant image.